In memory of Annabelle, who died this morning after a long and painful battle with the peritonitis that commonly affects the hens used for eggs, and which is caused by the genetic manipulations ALL egg laying hens are forced to endure in order to produce an unnaturally large number of unnaturally large eggs, in an unnaturally short amount of time; in sympathy with Miriam, Annabelle's bereft friend who, hours later, still refuses to leave her friend's side, and still screams and pecks at anyone who tries to remove her companion's lifeless body; in sorrow with the billions of animals who are harmed in the name of "humane" farming -- we would like to share a recent conversation with a supporter of The Humane League, an organization whose advocacy is predicated on the systematic betrayal of individuals like Annabelle and Miriam. We hope it will inspire you to advocate nothing less than the vegan imperative, and to always question and challenge individuals and organizations that claim the exploitation of animals can ever be done "humanely". My brother and I are throwing a party/fundraiser in Denver to bring vegans, vegetarians, etc. together. It's sponsored by Native Foods, featuring 2 epic speakers: a former undercover investigator from Compassion Over Killing, and National Director of Campaigns from the Humane League. Thank you for inviting me to your event in support of The Humane League. In response, I'd like to extend an invitation of my own: Please join us in our struggle to end the injustice that ALL farming/use is, rather than promoting and perpetuating it under the feel-good label, "humane". Help us remind everyone that there is NO humane way to enslave, mutilate, and kill fellow animals; help us educate consumers that vegan living is the only truly humane alternative, and the only ethically coherent action; help fellow activists understand that endorsing the idea of "humane" slavery and murder has catastrophic consequences both for the animals whose lives are crippled and crushed under those "improved welfare standards", and for the cause of animal liberation. What's Wrong with Backyard Eggs? Just a heads up, (though we are not 100% sure) the party will likely sell out by Wednesday night. I'm sure the party will sell out, P. What I'm wondering is if you are aware that the funds you raise for the Humane League will be used to run campaigns that harm animals. Campaigns that, in asking corporations to switch to "cage free" eggs, instead of NO eggs, not only ignore the root problem of animal exploitation, but exacerbate and perpetuate it by effectively urging consumers to switch from exploiting one group of victims to another. Are you OK with that? Thanks for the message. I totally appreciate and understand your concerns. I'm a nerd when it comes to "change psychology" and "scientific research" in regards to animal activism. And the current research leads us to the conclusion that these sorts of campaigns (along with vegan advocacy) will lead us to animal liberation the quickest. And the Humane League is constantly doing their own research to make their advocacy efforts more effective. So if they learn they are wrong about something they change. Also, the Humane League does not advocate consumers switching to cage free eggs. They've never done that. Hope that clears some things up. Feel free to respond. But I'm gonna have to cut my responses off here. 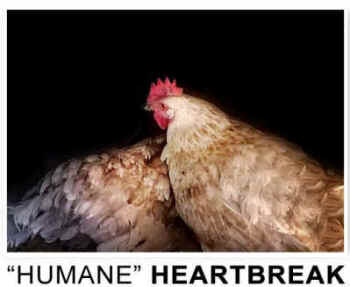 Thanks for the response, P, and rest assured, I have no interest in keeping this conversation going for its own sake, but I do want to leave you with this hard fact: The Humane League not only advocates a switch to "cage free" eggs, this betrayal is at the very center of their advocacy. So this is the type of "victory" that your support pays for. In their own words: "With this victory, a new bar has been set for the food industry. The Humane League is now campaigning to turn this historic commitment into the industry standard for battery cage boycotts. Please, support these campaigns, and together we can end the battery cage forever." Friendly reminder. You'd do well to research the organizations you endorse before enabling them to harm the animals with your support. As effective animal advocates we don't support organizations who oppose initiatives to end the worst abuses of farm animals. Thanks for your opinion, Joanna. Although we disagree, I can tell you have a good heart and really care about animals. As effective animal advocates, P, what we must do is have the intellectual honesty and the moral courage to learn the truth, confront the truth, and tell the truth. If we cherry pick the facts, package the truth, and hide behind meaningless, and destructive, slogans like, "initiatives to end the worst abuses of farm animals", we are not advocates, much less effective advocates, we are marketers whose job is to sell a product, not activists whose mission is to effect social change. Speaking of facts, be sure to read the links I sent you in my previous message so that you may understand why targeting "the worst abuses of farm animals" by advocating "lesser" forms of torture, ensures only that the abuse is perpetuated. I leave you with my sincerest wishes that you may find the strength and clarity to become an effective animal advocate.